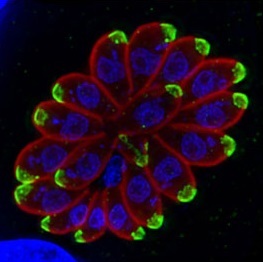 Toxoplasma gondii is not only an important human pathogen, but it can be used to aid understanding of Plasmodium cell biology. New insights into parasite motility mechanisms have created further questions about which factors are required for these parasites’ survival. It is estimated that around one third of the global population are infected by Toxoplasma gondii. This single celled parasite causes severe disease in people who are pregnant or immunocompromised. Infection occurs by ingestion of faecal-contaminated soil (on unwashed fruit and veg) or uncooked meat containing parasite cysts. Toxoplasma gondii could be classed as one of the most successful parasitic infections that we know of. It can infect almost all warm-blooded animals and cell types. Furthermore, it is even able to alter the behaviour of small rodents, causing them to be attracted to their feline predators. The rodent then gets itself eaten and the parasite is passed on to its definitive host: the cat. This is a very successful strategy for a parasite. Many researchers are interested in Toxoplasma for a different reason though: it can be used as a model organism to represent the biology of a similar parasite, namely the malaria parasite Plasmodium. Toxoplasma and Plasmodium are both members of the apicomplexan phylum and possess similar cell structure and lifecycle features. However, Toxoplasma is easier to culture in the laboratory than Plasmodium falciparum or P. vivax, is a larger organism, is more genetically tractable and has a lower biosecurity level. For these reasons, much of the work done to understand Plasmodium invasion has focused around the way Toxoplasma moves and invades cells. This is because they are both thought to share common gliding motility machinery. Gliding motility (a type of movement whereby the cell moves along a surface without changing its shape) is unique to members of the Apicomplexa. This is in contrast to the common models of eukaryote cell movement where either a leading edge of the cell reaches forward, anchors, and the rear end follows (termed cell crawling) or motility is flagellar driven. Gliding motility allows apicomplexan parasites to locate and enter host cells. It also allows them to leave the host cell when it can no longer support the parasite load. 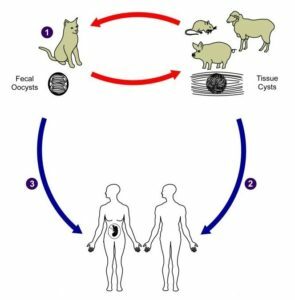 For Toxoplasma this occurs during its lytic lifecycle and it is how the parasite spreads rapidly within the host tissue. Plasmodium sporozoites also use this movement to travel from the cell dermis to a blood vessel after a mosquito feed. Knowing the individual mechanisms that are essential for parasites to complete their lifecycle is important for detecting drug and vaccine target candidates. Therefore, many groups have been studying the parasite gliding machinery, with the objective of blocking the entry of the parasite into the host cell, thereby allowing the immune system to eliminate the infection. acto-myosin motor complex. The acto-myosin system is often described in reference to how human muscle cells contract and there are several youtube videos that show this system. However, in Toxoplasma this system is substrate-dependent and allows the single-celled parasite to move in forward and circular motions. The acto-myosin system is made up of a complex of molecules and is thought to generate the force that causes the parasite to glide. Recently, the group led by Prof. Markus Meissner have been systematically knocking out the genes that form the acto-myosin motor complex. This process involves excising the specific genes from the parasites genome so that they are not able to generate the corresponding proteins. Despite the knock out, approximately 25 % of the parasites could still glide and invade cells. This work contributed to the identification of a flaw in the current understanding of acto-myosin function in Toxoplasma. The authors then observed that knock out parasites lacked the ability to withstand shear flow. They resolved that the Toxoplasma acto-myosin system, rather than acting simply as a motor, is required for attachment to a cell and acts as a force transducer. In this newly hypothesised model, the acto-myosin complex regulates and transmits the force, rather than being the generator of the force itself. This opens up the question of which mechanism is actually generating the force? One suggestion in the report was that it could be the backward flow of the parasites’ own membrane. This mechanism will therefore be the subject of future studies. This is an exciting area of research because the movement of Toxoplasma and Plasmodium is essential to their survival. Similar findings have indeed been observed in Plasmodium studies, where motility requires attaching and detaching mechanisms as well as a driving force. A vaccine that targets a Plasmodium motility protein (TRAP) was trialled, however, the efficacy was low. Perhaps new insights into gliding motility mechanisms will form a platform for different inhibitors to be tested for both Toxoplasma and Plasmodium therapeutics.